Planisphère suivant la projection de Mercator, Élémens de Géographie Moderne a l'usage des Collèges et Maisons d'Éducation, Redigés suivant la Methodes de MM Mentelle et l'Abbé Gautier; et en accord avec les traités, Cours et Leçons adoptés pour l'instruction publique ou particulière. An uncommon and attractive c. 1830 map of the world by the French map and atlas publisher Augustin Legrand illustrating several speculative northwest passages and submarine topography. Set on a Mercator Projection, the map is centered on the Pacific and includes the entire world with the exception of the extreme Arctic and Antarctic regions. The map proper is surrounded by allegorical imagery and extensive textual annotation. Cartographically the map is most interesting for its unusual depiction of American Arctic that combines the established geography of Captain James Cook (1728 - 1779) and Vitus Bering (1681 - 1741), with the geographical speculations of the late 18th century. From the middle off the 18h century until the seminal expeditions of James Cook in the 1770s Europe, and particularly France, was rife with academic speculation regarding the geography of the Pacific Northwest, the American Arctic, and the potential of a Northwest Passage. By 1830, most geographers agreed that the overland expedition Sir Alexander Mackenzie (1764 - 1820) and Samuel Hearne (1745 - 1792) definitively proved that no inland waterway connected the Hudson Bay to the Pacific; and similarly, that the explorations of James Cook and George Vancouver (1757 - 1798) proved that the northwest passage itself was untenable and that the supposed 1640 discoveries of the apocryphal of Admiral Bartholomew de Fonte, were naught but fiction. Nonetheless, some legends die hard and here we see a valiant attempt to reconcile 18th century speculative geography with actual discoveries. Seemingly ignoring the discoveries of Herne and Mackenzie, the cartographer ghosts in a speculative water route extending from the Hudson Bay to Great Slave Lake, after which a short overland portage would connect the route to a speculative inland waterway, a la De Fonte, to the Pacific. He similarly ghost maps Lake Valasco, as described by De Fonte's sub-captain, Pedro Bernarda, connecting it to the polar sea and known discovers of Melville Island, Baffin Bay, and Cumberland Island. Following the cartography of Lapie (1821) and the fictional geography of the Spanish adventurer Lorenzo Ferrer Maldonado (c. 1550 - 1625), the cartographer here maps the fictional lands of Kiteguen and Kioumi. Maldonado's accounts enjoyed a resurgence in popularity in the late 18th century and early 19th century, when they were published for the first time and attracted the attention of influential French cartographers such as Buache de Neuville. Kiteguen was supposedly a continent sized landmass that attached to Greenland, thus sheltering a supposed inland sea, Mer Polaire form the Arctic ice crating thus a navigable passage from Atlantic to Pacific. The map is also exceptional for its attempts to illustrate submarine topography in the Pacific, Atlantic, and Indian Oceans. Undersea mountain ranges notable correspond with known terrestrial mountain ranges - although many of these, such as the Mountains of the Moon (Ms. De la Lune) in Africa, are when this map was made, purely speculative. Surrounding the map proper are vignettes representing allegorical personifications of the continents of Europe, Asia, Africa, and America. It also includes annotations defining five races: Europeans, Mongols, Africans, Americans, Hyperboreans (Inuit Peoples). Legrand issued this map with educational purposes in mind and accordingly includes extensive annotations based upon the geographical systems of M. M. Mentellle and Abbe Gautier. Augustin Legrand (fl. c. 1800 - 1835) was a French engraver and publisher active in Paris in he early 19h century. 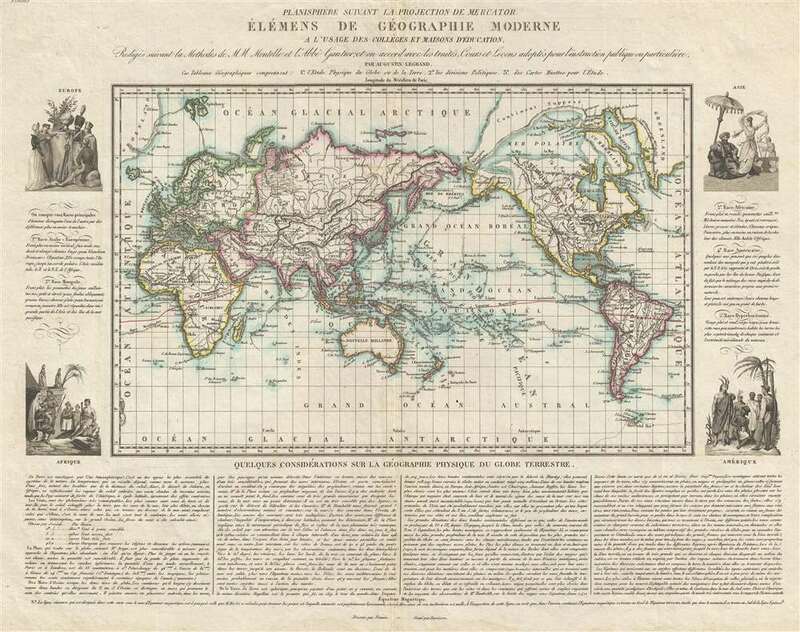 Legrand is best known for his small format folding pocket globe, but also issued the 1826 Atlas Geographique et Geologique des quatres parties du monde et de la France en particulier.. He should not be confused with the 18th century au pointille engraver of the same name. National Library of Australia, MAP RM 3407.